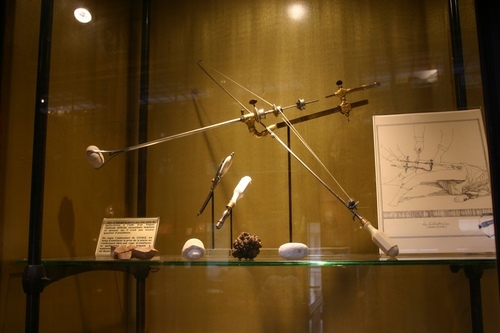 This dreadful medical device was invented by urology pioneer Jean Civiale to perform transurethral lithotripsy, the first known minimally invasive surgery, to crush stones inside the bladder without having to open the abdomen (lithotomy)1. it can be seen in a showcase of the Musée d'Histoire de la Médecine in Paris. Photo by Luca Borghi ti.supmacinu|ihgrob.l#| (July 2014), courtesy of Museum's director. 1. Wikipedia contributors. Lithotrite [Internet]. Wikipedia, The Free Encyclopedia; 2013 Nov 19, 10:35 UTC [cited 2016 Mar 23]. Available from: https://en.wikipedia.org/w/index.php?title=Lithotrite&oldid=582355106.